You know it’s Christmas when you’re wearing an oversized festive jumper. 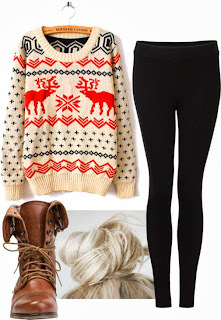 Match this with thick (very thick) leggings – not the kind that go translucent. To polish it all off, wear brown leather ankle boots and tie your hair up in a high-top bun. You may be sick of the usual greens, reds and golds. That's fine! You can go against the grain, but we'd recommend wearing something sparkly to stay in the Christmas mood. A silver sequinned shirt, covered with a pink cardigan is the perfect combination. Wear with mint green skinnies and pearls for a feminine Christmas look. 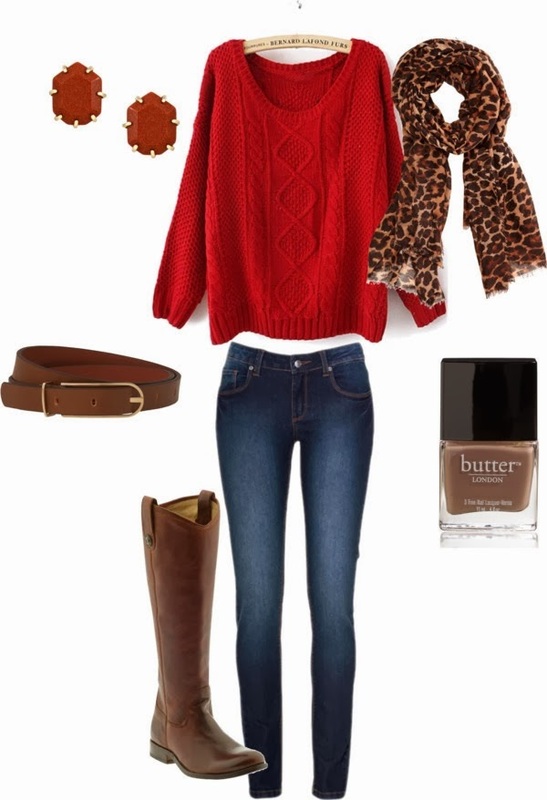 This outfit is perfect, if you want to look like an extra from Love Actually. We love the deep reds in this ensemble and with the layers, you’ll certainly stay warm. Dark blue jeans are more slimming than light, so you can hide those extra Christmas pounds. The statement fringe bag is certainly worth picking up too. A very simple Cameron Diaz (in The Holiday) inspired ensemble, the off-the-shoulder white jumper matches perfectly with slimline jeans. Christmas is all about enjoying yourself, so why fuss over your outfit too much? Slip into some woolly slippers and pour yourself a glass of mulled wine. Earthy tones are fantastic for a cabin getaway, so let’s stick to what we know and go for an oversized, baggy, reindeer jumper, matched with thick leggings, leather boots, a sandy red scarf, and a beautiful brown bag. If there ever was an excuse to wear a huge, red, knitted jumper, it’s Christmas. We’d suggest accessorising it with a leopard scarf and a pair of red stone earrings. Oh, and a pair of leather knee highs, of course. Glam up your nails with a nice mauvey-brown varnish. Sometimes, Christmas requires a dressier outfit. This does the job. A pair of black trousers, a flowing red top, heels, and a gorgeous rouge handbag. We’d recommend swapping the sandal heels for something warmer and choosing jewellery without blue stones to keep in with a more cohesive colour palette. Unless there’s winter sun glare, you won’t need the shades. This is a great combination for the cabin. 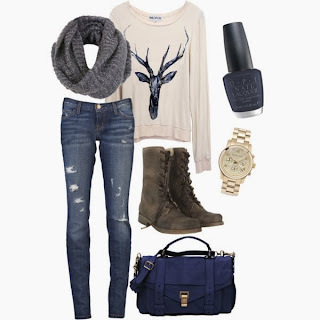 Choose some nicely distressed jeans, an antler top (it’s Xmas after all), a grey scarf, ruddy boots, a deep blue bag, and a white gold watch. Finish it all off with a few coats of dark blue nail varnish, and you’re ready to tackle anything this Christmas throws at you, whether that’s family squabbles or burned roast potatoes. This guest article was written by fashion freelance journalist, Ava. Visit http://www.pearlandbutler.com/ for some stunning costume jewellery. Loving all these looks! 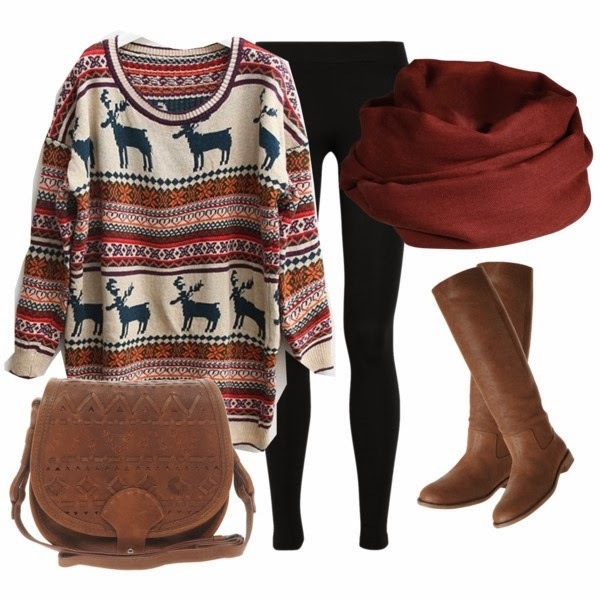 Nothing better than a cosy jumper.